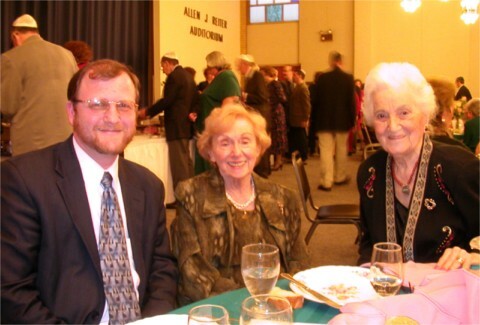 Rabbi Moshe P. Weisblum, Rebbitzen Emeritus Esther Rosenblatt, and Dora Kintberger Schleider at a recent dinner honoring past Sisterhood presidents on October 13, 2002. Photo taken in the Allen J. Reiter Auditorium. 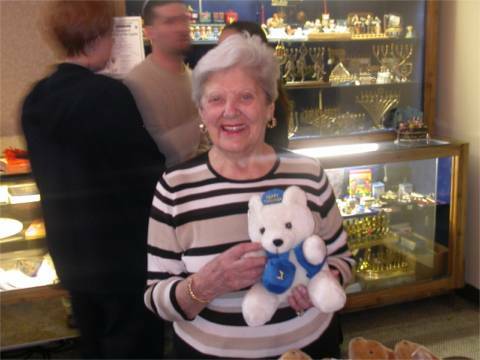 Sylvia L. Katcef shows one of the many nice gifts for sale at the Sisterhood gift shop right before Chanukah in 2002.